Over-the-counter medicine without palm oil is difficult to find. Palm oil derivatives are common in capsules, tablets and liquid medications. We seek out palm oil free medications because our son has negative reactions to palm oil. In the past, we didn’t realize the antihistamines and other medications were making him worse due to the palm oil derivatives in them. He would get sore throats from them. Recently, we found a palm oil free solution for antihistamines, allergy medications, fever reducers, etc. We have these over-the-counter (OTC) medications without palm oil. Please note, this is not medical advice. Discuss with your healthcare provider what medications you should take. Here we are sharing our experience. This is the way we were able to acquire palm oil free medicine. Read the labels for the vitamins, supplements, and medications in your home. Chances are, you will see at least one of these ingredients listed on each bottle or package because there are many palm oil uses in medicines. Ingredients such as Propylene Glycol keeps liquid medications shelf-stable. Polysorbate 80 helps bind ingredients together and to improve the consistency in gel caps. There are many other reasons as well, including using them as stabilizers and fillers. If you have a compounding pharmacy in your area, you may be able to get medicine without palm oil. You will need a prescription from your doctor. 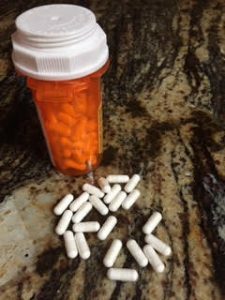 First, know what OTC medications you are trying to replace. Next, call the compounding pharmacy to ask if they have the active ingredient available. Ask the compounding pharmacy for approximate pricing before you call your doctor’s office to ask for a prescription. Most likely, the compounding pharmacy will not accept health insurance. Therefore, you will be paying for the medication out of pocket. It’s important for you to know the charges before you order the medicine. Find out as much as you can before you call the doctor’s office to minimize questions later. We didn’t realize the OTC children’s liquid Ibuprofen we were giving our son had palm oil derivatives. We wanted a palm free option on hand to be able to give him for fevers or pain relief. Because every label we read in the stores contained palm oil derivatives, we called a compounding pharmacy. We asked if we could have the Ibuprofen itself — the active ingredient in these OTC medicines — in some form. The person at the compounding pharmacy said we could with a prescription from our physician. They explained if it was a liquid, it would only last for 30 days (without the palm oil derivative-type of ingredients such as Propylene Glycol). In order for it to be shelf-stable longer than 30 days, we asked about them making it into a capsule form. After speaking with the compounding representative, I called my son’s pediatrician’s office. I explained what I wanted. 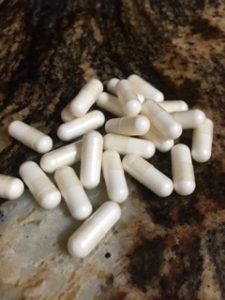 We now have 90 capsules, each with 400 mg of Ibuprofen, to have as the need arises. It’s essential you talk to the pharmacist once he/she has the prescription from your doctor. Our compounding pharmacist called us after she received it. You have to clarify what the pharmacy will make the capsule with. Originally, when I spoke with the rep, she said it would be derived from pine bark. Upon pressing further in the conversation with the pharmacist, I learned the capsules would contain Sodium Lauryl Sulfate as well. Sodium Lauryl Sulfate is often made from palm oil. After much consulting with the pharmacist, they were able to make it without the Sodium Lauryl Sulfate. Again, this is not medical advice. At the store, the pharmacist said to be sure we give him food when we give him Ibuprofen (adults too). She suggested a banana or yogurt, even if it was at night. She said the medicine is hard on the stomach. During the calls for the Ibuprofen, with the compounding pharmacy and doctor, I also asked for a palm oil free cough suppressant medicine. The doctor wrote a prescription for Dextromethorphan. They didn’t have it in stock and had to order it. The minimum they would fill was 90 capsules. Based on my son’s age and weight, the doctor prescribed 30 mg capsules. I picked up the Ibuprofen and asked about the capsule for the cough medicine. The representative again assured me it would be made from pine bark. After I pressed further, she said they would need to add a filler because each capsule was only 30 mg. It was too small an amount to fill with only the Dextromethorphan. If they did it by hand, it would be time-consuming and cost more. After discussing the options, we agreed upon baking soda, Sodium Bicarbonate, as the filler. We are very relieved to have these medicines on hand for the times our son is sick. Update: I am happy to report the Ibuprofen and cough medicine both relieved his symptoms and didn’t cause additional problems and reactions as medications have in the past. It is a huge relief to have these medications. We threw away our other OTC pain and cough medicines so we wouldn’t give them to him in error. A week after we picked up the above medicines, I ordered allergy medications. The OTC children’s liquid allergy medications we had in our medicine cabinet all had what-seemed-to-be palm oil derivatives in them. When my son took these medications, he would get a sore throat. First, I wanted a stripped-down Benadryl equivalent. The active ingredient in Benadryl is Diphenhydramine, a histamine-blocker. Second, I wanted an OTC allergy medication for typical allergy symptoms. I was hoping to get the active ingredient in Allegra. We had never used Zyrtec or Claritin. I called the same compounding pharmacy I used to get the Ibuprofen and cough medicine to ask if I could get these antihistamines. They had the active ingredient in Benadryl which they could make for me with a prescription. However, they were unable to get Fexofenadine, the name of the active ingredient in Allegra. The pharmacy rep said they could use the active ingredient in Zyrtec which is Cetirizin. She explained, however, “it would be expensive,” and dissuaded me from it. She needed to verify and call me back to see if they could get Loratadine, the active ingredient in Claritin. While I was waiting, I called another compounding pharmacy in our area. This second compounding pharmacy had the Benadryl equivalent, Diphenhydramine, in stock. They too were unable to get the Fexofenadine. However, they did have the Claritin equivalent, Loratadine, in stock. From this second pharmacy, I was able to acquire these antihistamines without palm oil. I phoned my son’s pediatrician’s office and explained exactly what I wanted in the form of these two medications. The pediatrician called me back. He was able to write the prescription like he did for the other two medications. When the pharmacist had the prescriptions, he called me to clarify and confirm what I wanted. We had a detailed conversation to ensure there wouldn’t be any palm oil derivatives in the capsules or as fillers. Now with four common OTC medications being palm oil free, we feel much better about giving these to our son when it’s necessary. Typically, the cheaper the cough drop, the more likely it contains palm oil. 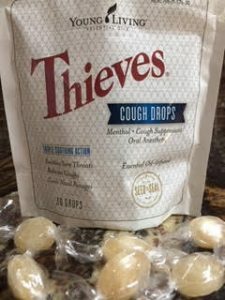 Name brand cough drops often contain Glycerin. Unless you contact the company directly to ask them the SOURCE of these ingredients, you won’t know if they are derived from palm oil. However, generally, companies are looking for inexpensive ingredients, and palm oil is cheap. We have not yet researched cough drops without palm oil. However, a brand to consider may be Halls Cough Drops. If you are at the store, you may want to keep this brand in mind. The active ingredient is 8 mg of menthol. Ingredients include 100% pure, therapeutic-grade essential oils. Also, they are free from preservatives, dyes, artificial flavors, and sugar. If you are seeking medicine without palm oil, it’s important to speak with your doctor. Most medications contain fillers, lubricants, stabilizers, emulsifiers, and more. In order to get a “stripped down” version, you will most likely need to go to a compounding pharmacy. Talk with your doctor about options for medicines. For us in our situation, it’s been reassuring to know we can give our son these palm oil free medications when he needs them. Many people avoid palm oil due to the environmental issues. Once you know names for palm oil derivatives, it may surprise you to learn how prevalent palm oil is in everyday products. Read labels. Be an educated consumer. See our list of palm oil free products and support them when you shop. What’s in your medicine? Please leave a note in the Comments.